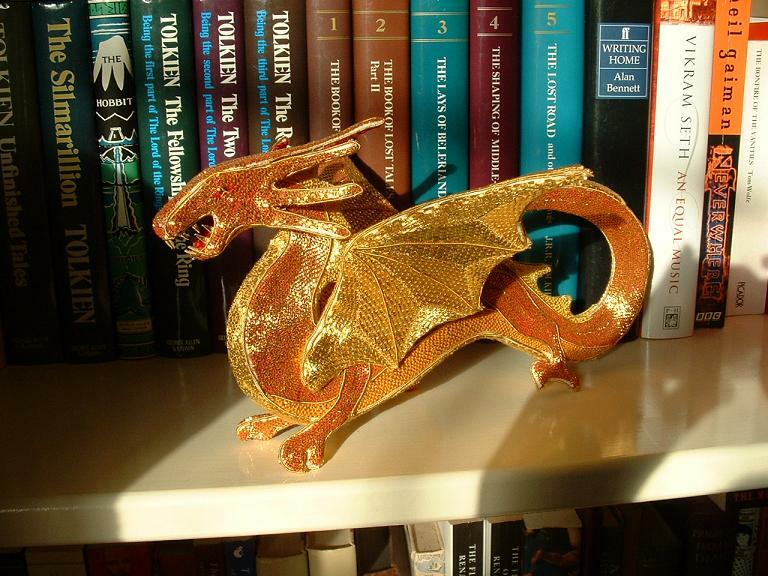 He's 3D and entirely freestanding, and is in goldwork, using coloured threads to couch the gold thread down; the idea was that this would look like scales. His underside and the underneath of his wings are couched with a plain thread, so they look gold rather than coloured. The original design was actually based on a cut-out-and-glue-together mobile from a book (Dragon Mobiles by Anne Wild); as this was meant to be hung up rather than standing it needed a little adaptation to make sure it was level, but not too much, plus some areas, like the wings and legs, needed to be made in two pieces rather than the one used in the mobile, to give a front and a back. There are quite a lot of individual parts, each of which was stitched separately. They were then cut out and mounted onto thin card (for the flat bits), pelmet Vilene (the wings, which were also wired), or a flexible plastic (the underside, which forms quite a complex curve). All the sections were then ladder stitched together, then pearl purl was couched over the seams, to hide them. He's a few years old now, and as he's been shown quite widely and hauled in and out of boxes, he's starting to show his age. The main problems are with his ankles, which have got quite weak; the card inside must have bent, and once there's a fold there, it'll always bend at that point. I think surgery may be required - I need to open his legs up and splint them somehow. I've made a few 3D items (such as the Dodecahedrons) and I'd like to explore this further when I get the opportunity, but I don't think I'll ever made something I'm as fond of as my goldwork Dragon. 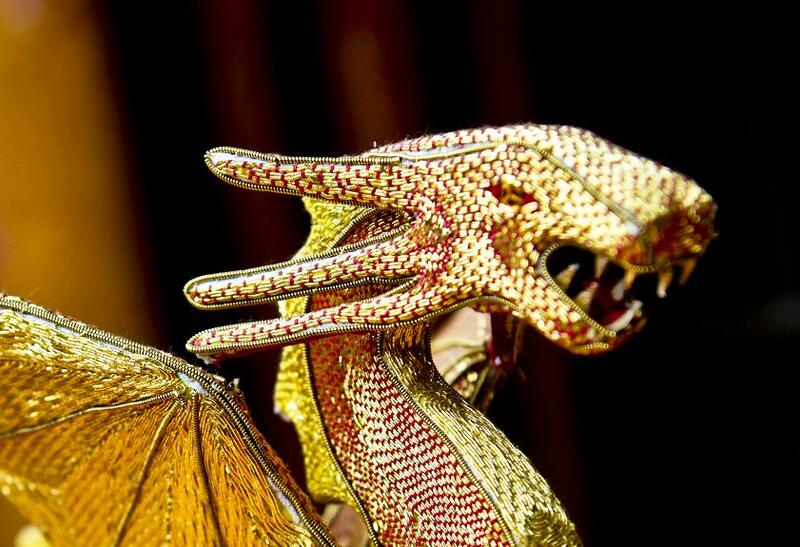 "The Dragon" is one of the most magnificent pieces of needlework I've ever seen. As a dragon collector and embroiderer, I must say he is the most beautiful dragon I have ever seen and I am appreciative of how much work went into creating him. Thank you for sharing. I admire him every time I visit your blog. He is absolutely splendid. Honestly, he's stunning. I love the effect of the coloured couching threads--it does indeed look like scales (at least in the photos). Amazing!